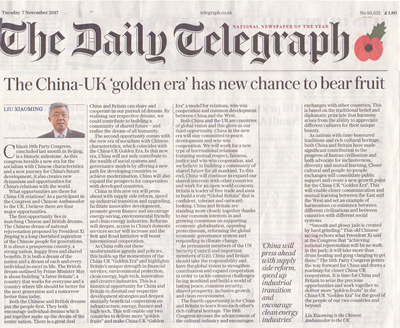 The Daily Telegraph Publishes a Signed Article by Ambassador Liu Xiaoming Entitled "The China-UK Golden Era has new chance to bear fruit"
China's 19th Party Congress, concluded last month in Beijing, is a historic milestone. As this congress heralds a new era for the socialism with Chinese characteristics and a new journey for China's future development, it also creates new dynamism and opportunities for China's relations with the world. What opportunities are there for China-UK relations? As a participant in the Congress and Chinese Ambassador to the UK, I believe there are four major opportunities. The first opportunity lies in matching Chinese and British dreams. The Chinese dream of national rejuvenation proposed by President Xi Jinping is a long cherished aspiration of the Chinese people for generations. It is about a prosperous country, a strong nation, happy lives and shared benefits. It is both a dream of the nation and a dream of each and every individual to excel in life. The British dream outlined by Prime Minister May is about building "a fairer Britain", a country that works for everyone and a country where life should be better for the next generation and a tomorrow better than today. Both the Chinese and British dreams put the people first. They both encourage individual dreams which put together make up the dream of the entire nation. There is a great deal China and Britain can share and cooperate in our pursuit of dreams. By realising our respective dreams, we could contribute to building a community of shared future – and realise the dream of all humanity. The second opportunity comes with the new era of socialism with Chinese characteristics, which coincides with the China-UK Golden Era. In this new era, China will not only contribute to the wealth of social systems and governance models by offering a new path for developing countries to achieve modernisation. China will also expand the prospects for cooperation with developed countries. China in this new era will press ahead with supply side reform, speed up industrial transition and upgrading, facilitate innovative development, promote green finance and encourage energy-saving, environmental friendly and clean energy industries. Reforms will deepen, access to China's domestic services sector will increase and the Belt and Road Initiative will boost international cooperation. As China rolls out these modernisation agenda and policies, this builds up the momentum of the China-UK "Golden Era" and highlights Britain's unique strength in financial services, environmental protection, clean energy, high-tech, innovation and creative industries. This is a historical opportunity for China and Britain to dovetail our respective development strategies and deepen mutually beneficial cooperation on infrastructure, energy, finance and high-tech. 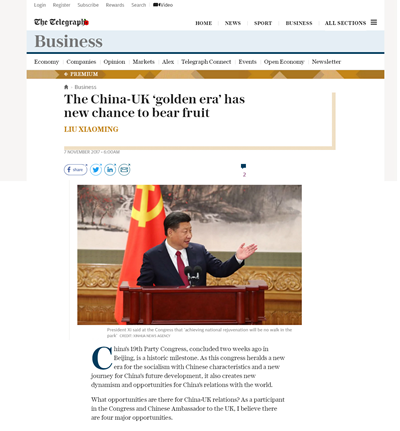 This will enable our two countries to deliver more "golden fruits" and make China-UK "Golden Era" a model for relations, win-win cooperation and common development between China and the West. Both China and the UK are countries of global vision and this gives us our third opportunity. China in the new era will stay committed to peace, development and win-win cooperation. We will work for a new type of international relations featuring mutual respect, fairness, justice and win-win cooperation, and we believe in building a community of shared future for all mankind. To this end, China will continue to expand our shared interests with other countries and work for an open world economy. Britain is leader of free trade and aims to build a truly "Global Britain" that is confident, tolerant and outward-looking. China and Britain are standing more closely together thanks to our common interests in and growing consensus on supporting economic globalisation, opposing protectionism, reforming the global economic governance system and responding to climate change. As permanent members of the UN Security Council and important members of G20, China and Britain should take the responsibility and have the global vision to strengthen coordination and expand cooperation in order to tackle common challenges facing mankind and build a world of lasting peace, common security, shared prosperity, inclusive growth and clean environment. The fourth opportunity is for China and Britain to learn from each other's rich cultural heritage. The 19th Congress stresses the advancement of the cultural industry and encourages exchanges with other countries. This is based on the traditional belief and diplomatic principle that harmony arises from the ability to appreciate different cultures for their unique beauty. As nations with time-honoured traditions and rich cultural heritage, both China and Britain have made significant contribution to the progress of human civilisation and both advocate for inclusiveness, diversity and mutual learning. Closer cultural and people-to-people exchanges will consolidate public support and create a new growth point for the China-UK "Golden Era". This will enable closer communication and mutual learning between the East and the West and set an example of harmonious co-existence between different civilizations and between countries with different social systems. "Smooth and glossy jade is created by hard grinding." This old Chinese saying echoes what President Xi said at the Congress that "achieving national rejuvenation will be no walk in the park; it will take more than drum beating and gong clanging to get there." The 19th Party Congress points the way forward for China and draws a roadmap for closer China-UK cooperation. It is time for China and Britain to seize the precious opportunities and work together to deliver more "golden fruits" in the China-UK "Golden Era" for the good of the people of our two countries and beyond.